Emily Young is an internationally renowned contemporary stone carver, creating large and complex pieces by hand. 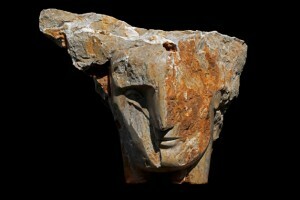 Her presiding value is to show the natural beauty constructed in the physical history of each piece of stone. This approach allows the viewer to participate in a profound way with the planet we all share. Allied with traditional carving skills, a rare and poetic presence, both contemporary and ancient, is created. and at Salisbury Cathedral and La Défense, Paris. Emily Young works in London and Italy.